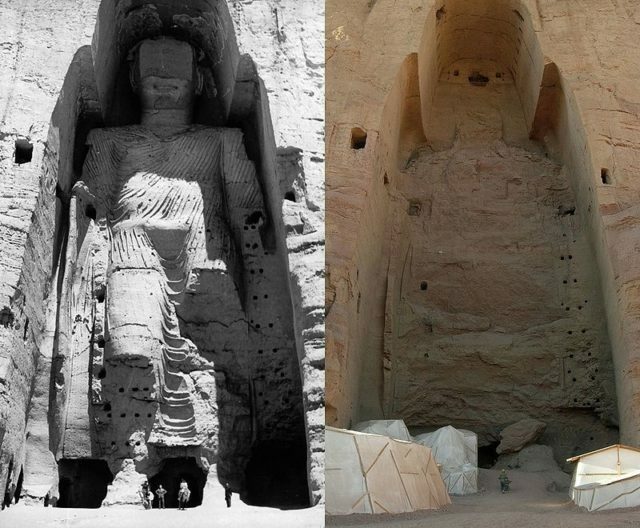 In the Bamyan Valley of central Afghanistan, two statues stood 35 and 53 meters tall. 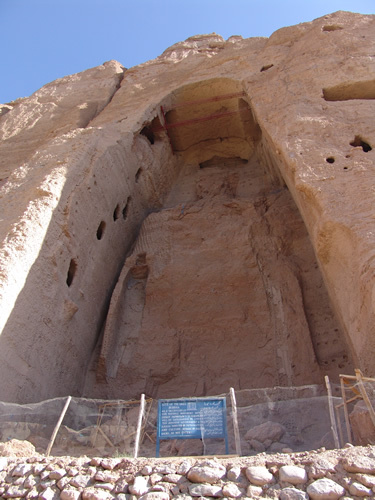 They were depictions of Buddha carved into the side of the cliff at different times – between 544 and 595 for the smaller statue, and between 591 and 644 for the larger one. They had been carved directly into the sandstone cliffs and details were added with stucco. This was then painted so the statues had clear faces and hands, and the folds of cloth could be seen. The larger statue was a carmine red and the smaller one was multi-colored. Most of this painted layer had worn off over time. It is thought that while the main bodies of the statues were made of sandstone, the faces had been a great wooden mask, as in photographs holes can be seen where pegs would have fit. 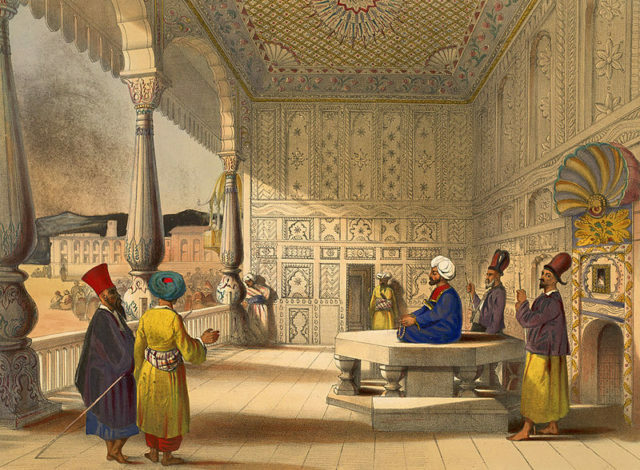 Interior of the palace of Shauh Shujah Ool Moolk, Late King of Cabul This lithograph is taken from plate 3 of ‘Afghaunistan’ by Lieutenant James Rattray. 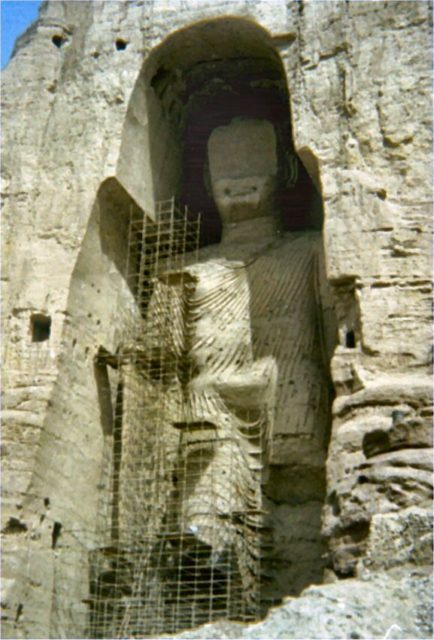 In March 2001, on orders from the Taliban leader Mullah Mohammed Omar, the two statues were dynamited and destroyed. They were declared false idols, but there have been other reasons put forward as to why they were destroyed. An envoy visiting the United States soon after the statues were bombed said they were destroyed in protest for international aid being reserved for their maintenance while the country was coping with famine. The Afghan Foreign Minister said that it was about Islamic religious iconoclasm; the destruction has been held up as an example of the intolerance that the Taliban has for other religions. Many countries have pledged their support for getting the statues rebuilt. Before being destroyed, these were the largest standing Buddha statues in the world. It was not the first time these statues have been attacked. Around 1221, the statues were assaulted at the behest of the Mongol ruler Genghis Khan, and in the 18th century, the Persian King Nader Afshar also fired heavy artillery at them. The face of the larger statue was destroyed by Afghan King Abdur Rahman Khan as an answer to the Shia Hazara rebellion. This time, the destruction of the statues took place over several weeks. 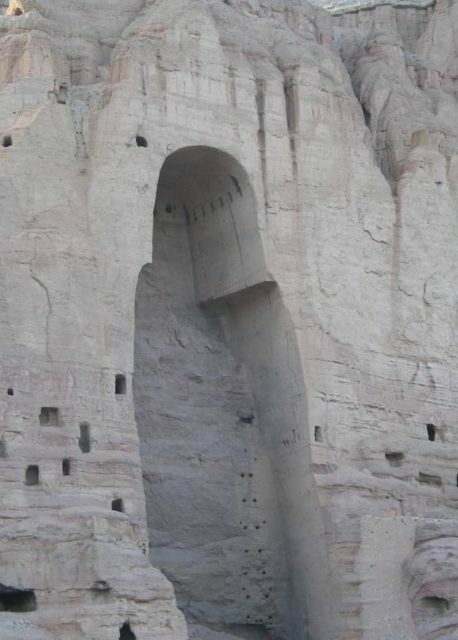 Initially, the Taliban had tried anti-aircraft guns and artillery, but these only damaged the statues. In the end, they used dynamite. 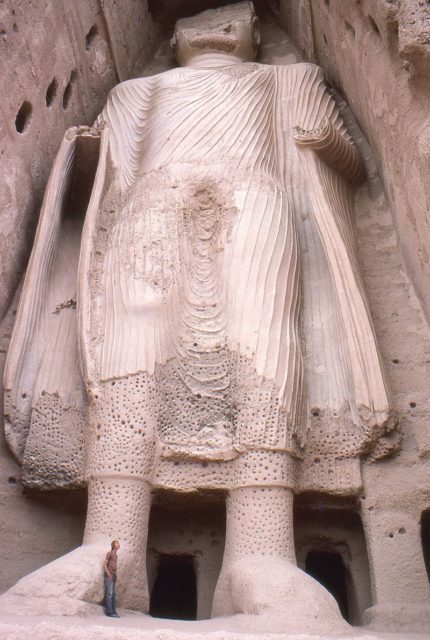 There are many reports of quotes from the Taliban leaders at the time – it seems that foreign experts approached them to offer to help restore the statues from the weather damage they had recently discovered. The Taliban leaders wanted the money diverted to help feed the starving people in the country that had been hit hard by famine. The expert was unable to help, as the money had been put aside just for the statues’ restoration. In a country full of people slowly dying from starvation, it is understandable that some anger was created by this exchange. The statues are pretty much completely gone now. However, after the Buddhas were destroyed, 50 new caves were discovered, and wall paintings were found in 12 of the caves. 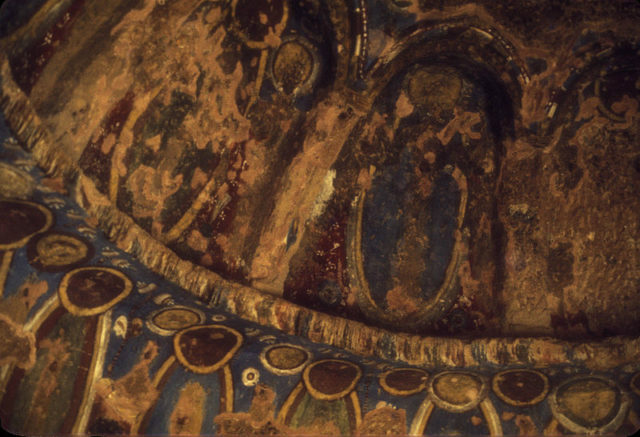 These are thought to have been painted in the 5th and 9th centuries, and it is probable that they were done by artists traveling the Silk Road. It is thought that these paintings could be the oldest oil paintings in existence. Work on restoring the Buddhas has started, using a technique called anatylosis – this is when the bits left from the original are combined with modern materials. It is thought that at least half the Buddhas can be put back together from the pieces. The work has come under criticism as some people believe they should remain the way they now are and some think the millions to be spent on them would be better used for improving the housing situation in the region.